Just when you thought the Borg could not be more cheesy, they outdo themselves. 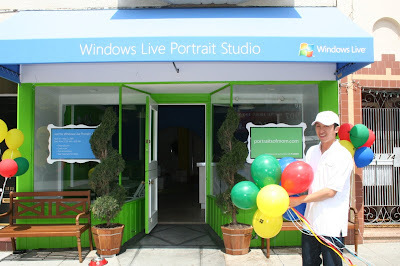 This time it’s a Windows Live portrait studio on Union Street in San Francisco, not far from our Chestnut Street store. Deal is you get a free Mother’s Day portrait if you sign up for Windows Live. Talk about customer acquisition costs. Question: Does anyone even know what Windows Live actually is? I mean it’s been out for years and I still don’t get it. I’ve tried reading their Web site to get info and it just makes me more confused. And now, just in case you weren’t baffled enough already, they’ve introduced Live Mesh. Or Live Mess, as we call it in Cupertino. What is it? Who knows? Who cares? All I know is it’s exactly what you’d expect to get if you took Ray Ozzie, the father of Lotus Notes, and put him in charge of a giant dysfunctional software company. Crazy complicated systems that can’t be described in a single sentence, or even a single page for that matter. Remember how many years Lotus spent trying to explain what Lotus Notes was? Then after about a decade they said, “It’s email.” Whew. Okay. Got it. You know the big joke among Lotus insiders when Microsoft acquired Ray Ozzie’s company, Groove Networks, was that at long last Lotus had triumphed over the Borg. The phone calls went something like this: Good news, comrade. We’ve finally got them just where we want them! Back then it was just a joke but you know what? It’s starting to sound not so funny. I’d almost believe IBM somehow set it up to get Ozzie planted into the Borg just so he could wreak havoc inside there. One thing is certain — Microsoft now has contracted a serious case of Ray Ozzie Disease, aka Featuritis Creepionis Complicationibus. And this is only the least of their problems. But I digress. Good luck with that Mother’s Day promo, frigtards. » Ray Ozzie? Uh, right.